Few figures loom as large in American history as George Washington. His powerful leadership, unflagging determination, and boundless patriotism would be essential to the winning of the Revolutionary War, the creation of the United States Constitution, and the establishment of a new government as the nation's first president. As time has passed, his legend has grown. Honesty — he could not tell a lie, we are told. Strength — he could throw a coin across the Potomac, the legend declares. Humility — he was offered an American crown, but turned it down in the name of democracy. Time may have made great myths out of small truths, but the contributions this one man made to the creation of the American nation cannot be denied. 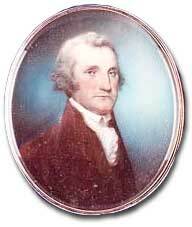 George Washington was born in Virginia in 1732 to a wealthy plantation owner. Of all the subjects he studied, he loved math the most. This prompted young George to apprentice as a surveyor of Virginia lands in his youth. Washington walked miles and miles through his home state surveying land. In the process he learned about the natural environment and developed a deep passion for his native Virginia. As a colonel in the British Army, Washington played a great part in starting the French and Indian War. He was ordered to deliver a message to French settlers whom the Virginia governor believed were encroaching on British lands. The French refused to yield, and instead built Fort Duquesne on the site to fortify their position. The governor sent Washington back to dislodge the soldiers, and fighting ensued. This first taste of battle was humbling to the twenty-two-year-old colonel. The French forced Washington to surrender after one third of his men had been killed or wounded. But there would be another time. When the tide of war turned in the British favor, Washington would return to Fort Duquesne, this time in triumph. The British burnt the fort to the ground and founded Fort Pitt — later Pittsburgh — after the man they believed led the British to success. Washington enjoyed victory at last. The experience of the French and Indian War earned him a reputation as a solid leader in the American colonies. The decision to name him commander of the Continental Army in 1775 was not difficult. He had already made a name for himself. But far greater glories were yet to come. Beginning with the painting on the rotunda of the U.S. Capitol, this site from University of Virginia examines how George Washington's image has changed over time. Biographical material and illustrations are included. George Washington kept copies of letters sent and received from 1754 through 1797 in a series of 41 Letterbooks, and all of them may be viewed in manuscript form at this site from the Library of Congress. Also here are facsimiles of his many account books, personal and professional. Some documents have been transcribed from the manuscript and the entire collection is searchable. Aged 22 and inexperienced, George Washington encountered French soldiers at Jumonville Glen. The resulting skirmish was Washington's first taste of battle and led to the first battle of the French and Indian War. Be a guest at George Washington's home at Mount Vernon and tour the rooms and grounds with photos and informative text. Check out the progress of the archaeological digs and be sure to stop in at the Pioneer Farmer exhibit. A wealth of information on George Washington from the University of Virginia. Many of his writings are here, as well as scholarly articles written about our first president. Thorough and lavishly illustrated.